‘A More Informed, Inclusive Perspective’ Studying Arabic in Jordan and Lebanon has given Sierra Terrana '20 a new outlook on Islam and the Middle East—one that she hopes to parlay into a legal career. 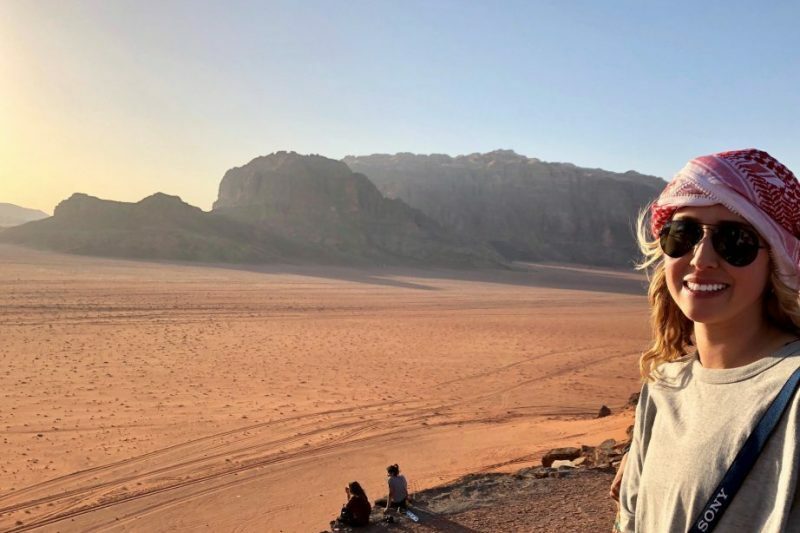 Sierra Terrana ’20 at Wadi Rum in Southern Jordan. Having attended a small, private school for 10 years, and a public high school with an enrollment larger than W&L’s, I was familiar with the benefits and shortcomings of each type of institution at the time of my application. I chose W&L because it provides students with many of the opportunities offered by larger, research universities without sacrificing small class settings or a sense of community. During my campus visit, I was struck by the genuine kindness shown to me by both students and faculty, and I still feel privileged to be a part of such a talented and close-knit community. What made you decide on your major and minor? How do they work together to personalize your education? I decided to major in English for the sake of my own intrinsic love of words as well as for the empathetic but highly critical mindset cultivated by literature. My interest in the Arabic language and Middle Eastern society began with a research project that I was assigned during my first year, for which I chose to analyze Daesh online propaganda. Through my research, I became increasingly aware of the lack of understanding surrounding Islam and the Middle East, and decided to study Arabic in an effort to engage more authentically with the region and its people. As I continue to work toward a more informed, inclusive perspective, I hope to approach current issues with the intellectual and cultural humility that they require. Besides Lexington, where have you studied so far during your college career? What impact did those experiences have on you? I spent the summer with an intensive Arabic program in Amman, Jordan, and studied at the American University of Beirut in Lebanon for the fall semester. My time in both countries has allowed me to experience the beauty and hospitality of Arab culture while cementing my desire to serve as an advocate for its people. Specifically, through my work with a Beirut-based NGO, I have become more attentive to particular gender-based issues as well as to the deteriorating condition of migrant domestic workers in Lebanon. I hope to continue my involvement with each. 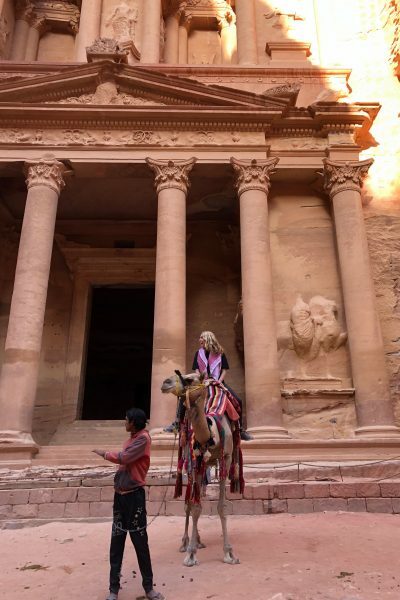 Sierra Terrana ’20 explores Petra in Southern Jordan. What made it possible for you to study abroad? I received the Powell Arabic Study Abroad Award and a fellowship from W&L’s Center for International Education. How does your involvement with the W&L Mudd Journal of Ethics complement your courses of study? As an editor for the Mudd journal, I have the privilege of reviewing submissions that apply an ethical framework to a breadth of contemporary arguments and academic disciplines — last year, for example, we published papers on topics ranging from medical care and multiculturalism to the ethics of immortality. Considering the different ethical arguments situated within so many contemporary issues has both complicated my own views and made me more receptive to differing ones. There are too many to name, but Professor Antoine Edwards has been particularly supportive of my efforts to study in Lebanon and continues to serve as an inspiration to me. I also think that Suzanne Keen, former dean of the College, is brilliant. I wish I could have taken her narrative theory course during her time at W&L. Favorite Lexington restaurant and dish? I love Blue Phoenix’s salads and kombucha. What’s one film/book that you recommend to everyone? That I’d actually need a coat for winter. I hope to attend law school and to continue studying Arabic. Last year, Professor Kameliya Atanasova taught a class on Islamic mysticism and organized a traditional Sufi dervish performance at W&L. It was really special to actually observe and participate in the same ceremony we had spent the semester studying, and to have the opportunity to speak with the dervishes about their spiritual beliefs and culture.